A comprehensive review of the literature from Delft University found that there are four headline areas important to biking: environment (hilliness and climate), attitude (how socially acceptable and normalized biking is), infrastructure (bike lanes) and land use (the mix of uses) . The Delft team found that hilly terrain was most attractive to experienced and recreational bikers while flat terrain was most attractive to inexperienced or casual bikers. This is understandable: for people biking for sport, the sense of accomplishment at the peak of a hill and the reward of grand views of the countryside are likely to be the reason you’re biking at all. Casual cyclists are likely making a trip to the store, to a friend’s house, or to work – hardly the time to get sweaty for the sake of a view. The magnitude of this influence varies from study to study, but most point to it being statistically significant. Climate and season can play another important role. In climates where rain is possible on any given day, cycling is less common than might be expected, as rain is generally named the least pleasant biking weather. Wetter climates, then, tend to also be less likely to see biking than might otherwise be expected. Other factors can mitigate this, of course – witness the popularity of cycling in soggy Amsterdam – but it remains a big factor outside of such cycling utopias. Colder climates are also not great for biking, as they see significant dips in ridership in winter and spring. For a consistent transportation mode, then, such areas need to plan for heavier use of cars and transit in winter months. Warmer weather, even days with consistent temperatures above 80 degrees, is seen as more bike-friendly than colder weather, even at a relatively moderate 60 degrees. Taking all this into account, Marin has a wonderfully bike-friendly natural environment: its rainy season is relatively short, its temperatures are fairly warm, and most of the development is either on relatively flat valley floors or along the bay. Problems arise when cyclists try to move between valleys, where steep hills make biking a strenuous affair, but most people don’t live in hillside neighborhoods and even fewer jobs are at the top of hills (north San Rafael excluded). It is important for cycling to be socially acceptable and normalized for it to become popular. This is, of course, self-fulfilling: people will choose modes that are seen as normal, but modes can’t become normalized until people use them. Equally obvious, though still worth mentioning, is that people need to feel positive about cycling in order to make it into a habit. This might mean that they view it as healthy, frugal, or environmentally friendly, or just safe and convenient. People also become habituated to whatever mode they usually use. Getting someone to switch to cycling from some other mode of transportation requires a little extra oomph to get them over the hump, but once they are there they will likely stay until some other oomph pushes them into another mode. Marinites undoubtedly have high regard for biking, but not necessarily for non-recreational purposes. There are ways to improve upon this, such as publicity campaigns, but changing public opinion is a long process. The most visible, and most expensive, aspect of cycling as a mode is the infrastructure itself. Though other factors like environment and attitude play a role, planners have the most direct control over infrastructure: what to buy. This, really, is the multi-million dollar question. The Delft team examined the significant literature on the subject and found that most studies point to protected bike paths (i.e., Class I and Class IV bike lanes) as being significantly correlated with bike commute mode share. While unimportant to experienced cyclists, they are crucial for inexperienced cyclists. Women, too, were found to cycle more when these protected lanes were put into place. Continuity of these paths is also important so that trips can be made entirely within the protected bike lane network without detours. Such lanes are likely most important on roads with heavy traffic. Such roads are generally viewed negatively by cyclists, and so mitigating measures – like protected bike lanes – need to be installed for the sake of the perceptions of safety. 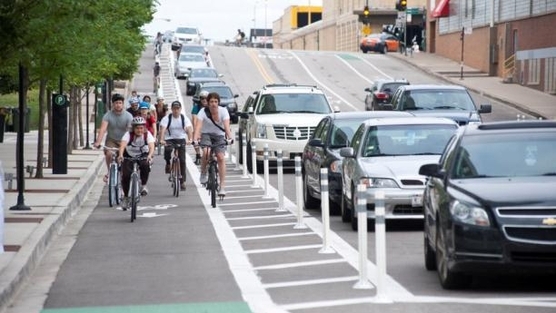 Unfortunately, the literature review found that despite significant literature on cycling there was little research into whether or how a new bike lane or bike lane network actually increases cycling. At least according to these researchers, a planner cannot say that adding a bike lane here will increase bike ridership by a certain percentage. This is likely because, like fax machines, a protected bike lane is only as good as what it connects to. That said, the Transportation Research Board (TRB) has published a guidebook  for estimating the modal split of both for work and for non-work using network access. A reasonably well-trained planner should be able to use mapping tools and the data available from any road transportation planning office to estimate where there might be the most pent-up demand for biking. Marin has plenty of recreational pathways and Class II (normal) bike lanes but few on-street protected bike lanes. Further, the recreational pathways tend to be circuitous or disconnected from practical destinations. This is an area where the county could certainly improve. The paper also looked at the influence of at-work facilities, like showers or lockers, and found that they didn’t influence bike-to-work numbers. The most important land use factor seems to be the mix of uses within a given area, so a blend of homes, shops, and offices, and not necessarily density. While density may be a factor, papers on the subject were inconclusive. Note that density is important to support a mix of uses beyond homes, but even single-family housing can support retail within an easy biking distance. The Delft team cites a few reasons why use mixing may be important. First, a variety of origins and destinations need to be within easy reach of one another. Trip distance is incredibly important for boosting cycling, with most non-work trips being less than 2 miles. Commutes can be longer, with one study putting the average commute distance at about 7 miles for men and 4 miles for women, but they are still relatively small hops. Another reason is trip chaining. One study found that potential cyclists, especially women, cite a need to run errands and fetch children as important factors in their decisions. A mix of uses, especially near schools, would help address that need. Marin has a transit-oriented history, and so in Central and Southern Marin mixed-use areas are common. In Novato and North San Rafael, outside the Interurban’s area of influence, malls, shops, and schools are generally within easy cycling distance from homes. So, what’s needed to make bicycling common? A place needs the right weather, fairly flat topography, mixed land-use, a pro-bike attitude, and a network of protected bike paths both on- and off-street. Judging by the experiences of countries where cycling is very common, like The Netherlands and Denmark, climate can be overcome with the right land-use, infrastructure, attitude, and topography. Given Marin’s climate and attitudes towards cycling, it seems as though efforts to move people to bike more should work well. The most successful history of biking in the county comes from Safe Routes to School, which now sees almost 60 percent of students arriving at school by a means other than a car. Biking to work, however, remains quite low on a county-wide level. There may be more people regularly using their bike for errands or recreation, but there isn’t reliable data on non-work trips. What Marin lacks is good connectivity to and within most of its employment centers: downtown and North San Rafael, The Canal, and eastern Corte Madera. (Sausalito is well-served by the Mill Valley-Sausalito Pathway.) The inherent uncertainty of how any given path would influence cycling in the greater region makes it unclear whether investments would actually pay off with an increase in ridership, even with the TRB model. Further, it wouldn’t be worthwhile for a city or TAM to build a full network of bike paths in the dark. Marin, then, needs to test whether certain corridors are worth building with temporary protected bike paths, or to build easy connections that would bring minimal disruption and have minimal cost. They could then compare these results to the estimates from the TRB model and determine whether it works for Marin’s context. Minimal cost and ease of construction are things that Marin thus far has shied away from, choosing expensive off-street paths that are politically easy but expensive over cheap on-street paths that drivers might oppose. That’s a political problem, but all the elements seem to be in place to make cycling a success story, if only Marin would build where people need to go. Ashley Fisher, Sharrow!, August 13, 2008, photo. Joe Linton, Temple-City-9-14May18, May 22, 2014, Digital Photograph. J. Richard Kuzmyak et al., Estimating Bicycling and Walking for Planning and Project Development: A Guidebook (Washington, D.C.: Transportation Research Board, 2014).